Improve your long-term financial outlook with action-oriented goals for 2018 that will have a measurable impact. 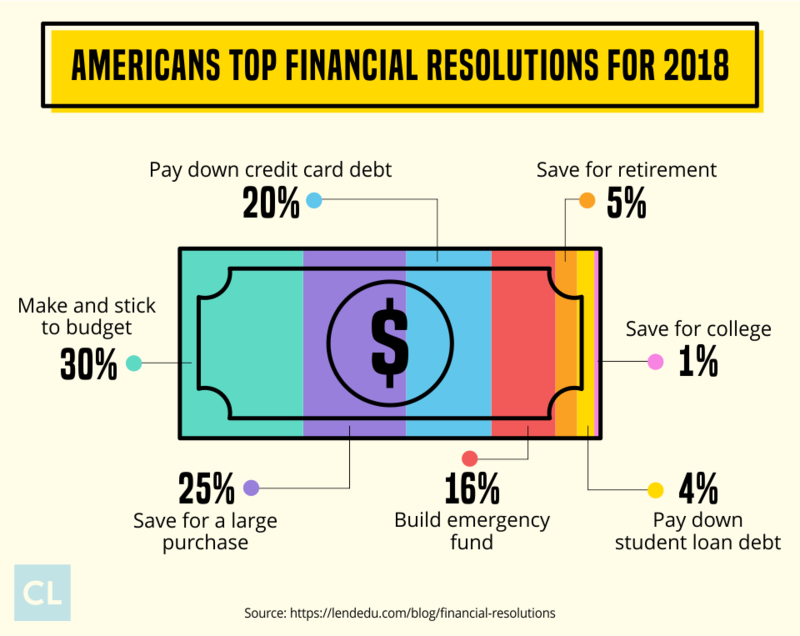 See our list of top financial resolutions and get started! With a new year comes a fresh chance to set new money goals while banishing old habits that can hurt your long-term financial future. Since 1998, we've been helping to educate consumers on financial issues while providing the tools and solutions they need to effectively manage these issues. And we know from experience that breaking bad financial habits and replacing them with good ones takes practice. Choose at least one of the resolutions below and make smarter decisions to work toward your goals. So much of good personal finance is simply being financially aware. But a staggering 95% of people don't have an accurate idea of their net worth. If you don't know where you stand, it's tough to figure out where to go to reach your goals. There are tools to help you track net worth. Using CreditLoan.com's net worth calculator, calculate your assets (retirement accounts, savings, investments) and debts (student loans, car loans, mortgages). Paying off debt is one of the top financial resolutions each year, in part because so many of us are swimming in it. Try negotiating. Shedding even a few points off your rate can save you hundreds of dollars, so call your credit card company and ask if they'll lower it. If you've been a reliable customer, they won't want you to transfer your debt to another lender with better terms. Next, prioritize your debts. List all your loans and credit cards, what you owe on each, their interest rates, and any annual fees. Tackle highest interest rate debts. Though it will feel like a slog, this is the most efficient way to pay off debts because it will more effectively wipe out future interest payments, saving you money in the long run. Pay off the smaller amounts. This won't save you as much, but it can feel more satisfying to see the number of debts you have disappear, which can help you stick with your payment plan longer. Finally, consider a 0% balance transfer. Eliminate debt faster by transferring as much as you can to a 0% APR credit card where every dollar you pay chips away at your principal balance. Putting something on your card instead of taking out a personal loan can have significant, lasting effects on your finances. I learned quickly, in the above instance, where I simply did not want to keep giving large amounts of money away for virtually no reason, especially when my business was young and had little extra to spare. In the early days, I had to quickly become more scrappy and savvy with my finances. After a few easy steps like setting up auto pay on my accounts, I never had to worry about compounding interest on a credit card, and basically giving the credit card company free money. Financial planners recommend having enough to cover up to six months of expenses, but according to the Federal Reserve, 52% of Americans can't handle $400 in emergency costs. Set up a savings direct deposit. When you route money from each paycheck directly into your savings, it removes the temptation to spend. Try the Post-It method. It can be hard to visualize saving for an abstract financial goal when you're standing at the checkout line with a shiny object in your hand. So make your goal tangible: Simply write it down on a sticky note ("$2,000 in emergency funds") and tape it to your credit card. You'll think twice the next time you reach for the plastic. Enlist an ally. You can encourage a savings habit by recruiting allies to help keep you accountable. Share your saving goals on social media or Stickk.com to set up incentives and penalties and help track your progress. With the average amount needed to retire in the U.S. surpassing $1 million, saving for retirement should be a priority for everyone. Get that tax-advantaged goodness. Thanks to the magic of compound interest, you can build a generous nest egg tax-free if you're socking money away in a retirement account like a Roth IRA or Roth 401(k). Max out your 401(k) match. Many companies offer a match, but one in four employees miss out on receiving the full amount, leaving an average of $1,336 on the table each year. Make your raise count. If you got a raise this year, contribute the additional income to your retirement investments. Your current standard of living won't suffer, while your future standard of living will markedly improve. Only 14.5% of adults have a credit score in the top tier of 800–850, while one in three has subprime credit (below 620). Check your score.Discover allows you to check your FICO score every 30 days without incurring a ding on your credit, even if you're not their customer. Start building good credit.The most important factor in your score is your on-time payment history, so the best way to improve your credit is to maintain an open credit card account in good standing. If you don't qualify for a normal credit card, a secured credit card is a great way to re-establish credit. 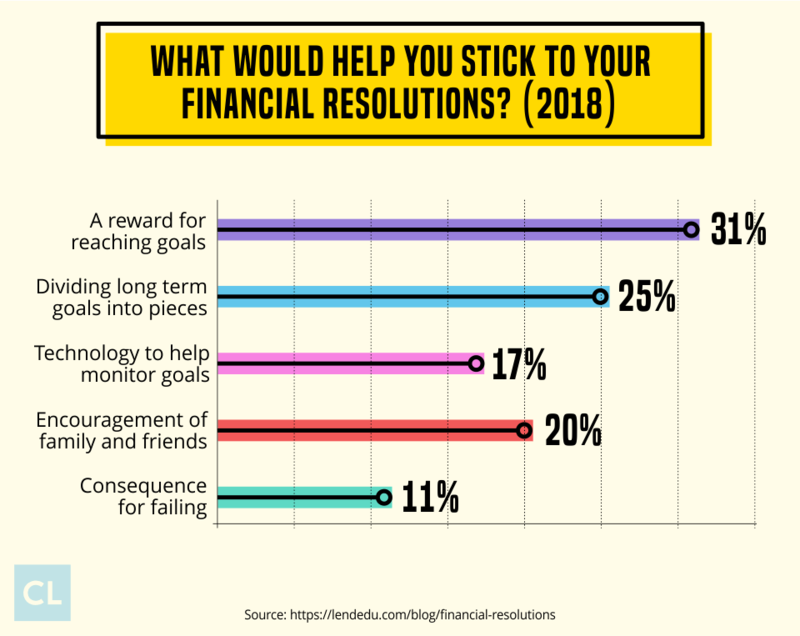 What are your top financial resolutions? What have you tried in the past and found didn't work?